While Land Rover vehicles can take on any obstacles in the desert, it cannot be said the same of their owners. Scorching temperatures, deadly animals and sinkholes are just a few things they might encounter. And when they venture deep into it, even the most experienced drivers can quickly succumb to the harshness of the desert. Land Rover in the United Arab Emirates worked with Y&R Dubai to create a survival guide explaining the basics for staying alive in the Arabian Desert, packaged it in a way that would spur the attention of our target audience. Y&R Dubai researched every indigenous animal and plant, people could encounter in the Arabian Desert and how they could be used to survive. They studied the topography of the region to guide people to safety. The agency used a reflective packaging similar to army rations, which could be used to signal for help, and bound the book with a metal spiral, which could be used for cooking. Finally, the agency even took an extra step so that in case of emergency, people could always EAT the book. It was made out of edible ink and paper, and it had a nutritional value close to that of a cheeseburger. We sent the book to 5,000 existing customers, gave it away as a supplement to the cars’ manual and made it freely available in sports shops. The initial response was very positive. Land Rover was so happy with the concept they decided to include the book as an insert in the next edition of a car magazine, with a 70,000 circulation. 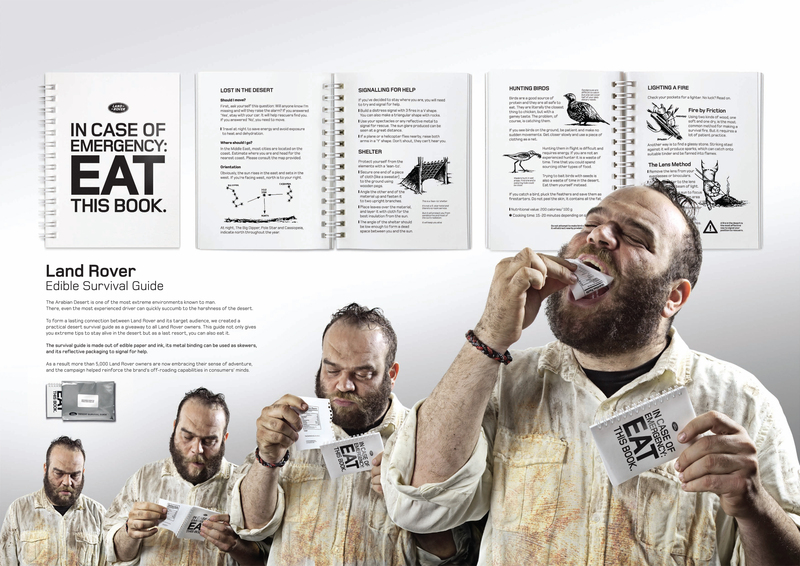 The Edible Survival Guide was developed at Y&R Dubai by chief creative officer/creative director/copywriter Shahir Zag, creative director/art director/designer/illustrator Joseph Bihag, copywriter Guillaume Calmelet, designer/copywriter Khaled Said, retoucher Gitten Tom, head of production Amin Soltani, producer Leng Panganiban, account supervisor Sarah Locke, account manager Pierre Farra, photographer Mojtaba Komeili.